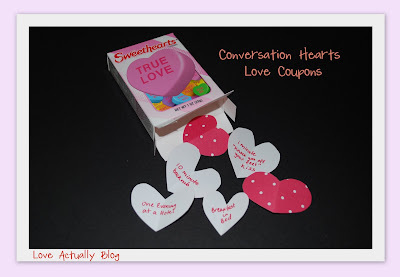 Just empty out those nasty candies and replace them with your own sweet love coupons...sure to leave a better taste in your Valentine's mouth! 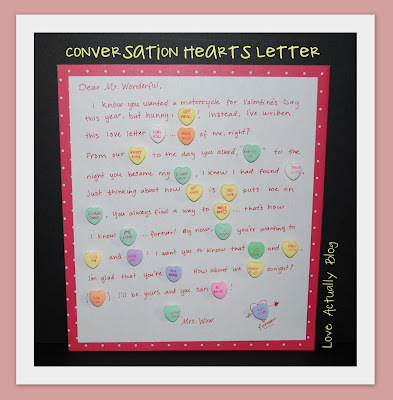 How about a handwritten love letter using conversation hearts...however silly it may be! You can create your own personalized conversation hearts HERE. You can write whatever you want (with a certain # of characters) as many times as you like and it allows you to save each as a JPEG. So, you could type a letter on your word processor and insert your custom images into your letter, or just print each custom heart image and glue onto your handwritten letter. Easy-peasy. I love the letter idea...and the customized sweethearts! Thanks so much for sharing all that you do. You always have great ideas! Thanks for the ideas! Haha love the website, having fun! Thanks for the clever ideas! I've just recently discovered your blog and I LOVE it!! I wrote a conversation hear letter for my hubby and he loved it! Thanks again.